Supercharge your workflow with Media Automation, the simplest and most intuitive way for broadcasters and publishers to manage and re-distribute commercial content. Make quick work of incoming ad content. Media Automation plugs right into your existing systems for seamless ingest, re-purposing and distribution to production teams, and playout systems. Keep commercial management clean and simple by isolating commercial workflows from incumbent, labourious broadcast infrastructure. Automate quality control, versioning, transcoding and metadata alignment for easy hands-free routing to VOD, OTT plus digital video and print destinations. Aggregate your commercials into a single UI. Media Automation lets you easily receive and manage incoming content from any source. Quickly sign-off work, connect with teams and partners, manage content rights, track versions and create sales presentations. Automate your quality control, versioning, transcoding and metadata alignment. Then, route content to VOD, OTT, and digital destinations completely hands-free. Media Automation is everything you need to supercharge your commercial media workflow. 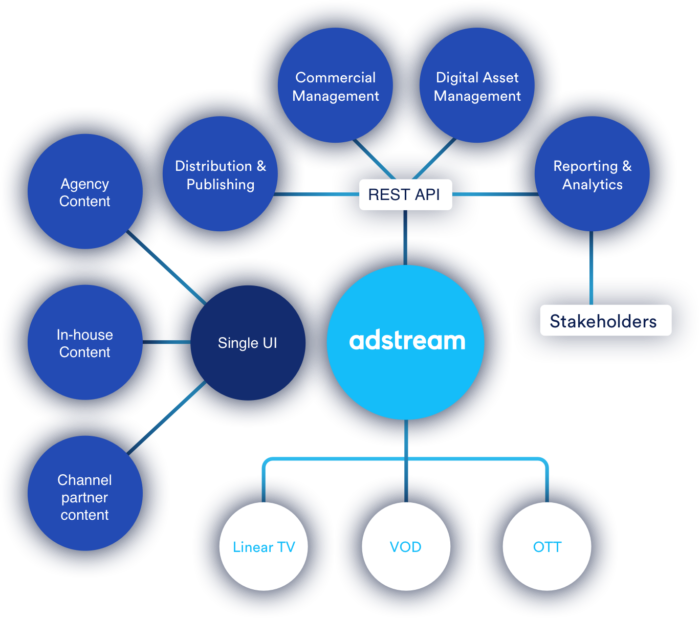 Connect Adstream with the rest of your tools and sync creative files to your advertising, marketing, sales and financial solutions.